Congratulations to our March Wildcats! Great job following the Wildcat Way! This past weekend the Woodfield Choir students, led by Mrs. Barb Canales had the privilege to sing the National Anthem at the Milwaukee Wave game. What a great experience for these students. Big shout out to local author Marla McKenna for spending her day with our students guiding them through the process of becoming a published author and reading her books to them! It was a special day! Congratulations to our Woodfield Wildcats on placing in the TOP 5 at our local Math 24 event between 6 surrounding schools! Great job representing Woodfield with perseverance and determination! Couldn't make it to 4K/New 5K sign up? No problem! Stop in at the WF office anytime between 7:45am-3:45pm and we can get your child enrolled for 2019-2020! Do you have a child who will be eligible for 4K for the 2019-2020 school year? Or do you have a student that did not attend 4K at WGSD but will be enrolled for 5K with us? We will be hosting an enrollment date on Tuesday, February 5th from 9-6 p.m. at your local school. Join us in celebrating our November Wildcats! These students have been selected by our teachers for following the Wildcat Way! We're excited to kick off our kindness challenge for December! Our amazing students completed their 3rd puzzle of the year! To celebrate their hard work earning cat cash we held an ALL SCHOOL MOVIE. Students from 4K-6th grade spent the afternoon watching "Inside Out!" Great jobs Wildcats!!! 6th Graders from WF helped the WSSA (World Sport Stacking Association) try to break their own Guiness World Records record of 622,809 stackers speed stacking on the same day from multiple locations around the world!!! We are waiting to hear results if they broke the record! Congratulations to our October Wildcats! These students were nominated by staff members for exemplary display of the WILDCAT WAY! Great job Wildcats! Stop by the Book Fair tonight or tomorrow during parent-teacher conferences! Click the link to order online: http://onlinebookfairs.scholastic.com/entrance.aspx?FID=3859804&direct=Y All online orders ship for free to our school! Any purchase benefits WOODFIELD!!! The Village of Waterford and Town of Vernon Fire Department and Emergency Medical Team visited Woodfield today to talk to our students about Fire & Emergency safety! Today we celebrated our 1st Wildcat Wonders recipients of the year! These students were nominated by our teachers/specialists for showing the Wildcat Way! *BE SAFE*BE RESPECTFUL*BE RESPONSIBLE*BE A CONFIDENT LEARNER! They did it! Our students finished their first PBIS puzzle and earned an ALL SCHOOL RECESS as a reward! We're very proud of the work our students have done this month following the WILDCAT WAY: BE SAFE, BE RESPECTFUL, BE RESPONSIBLE, BE A CONFIDENT LEARNER! Great job Wildcats! Our 5K-6th grade students participated in our Recess Rodeo last week. Students were invited to our playground to learn safe playground practices! Use this link: https://www.smore.com/jbnme to read our August newsletter from Ms. Conners! Don't forget to log onto to Skyward Family Access beginning Monday, August 6th to register each of your children via Skyward. Click here for the website: https://skyweb.waterford.k12.wi.us/scripts/wsisa.dll/WService=wsEAplus/fwemnu01.w Visit our news section for more details. Congratulations to our final WILDCAT WONDERS of the year! We are so proud of the work our students have done this year! Mr. Hawkinson from Waterford High School brought his AP Physic's students to our green wing today! What a fun learning experience! Our WUHS Pep Band visited us today! It was great to see some former Woodfield students! Check out the news section for more photos/videos. L is for Lunch outside!!! Our students enjoyed taking a break from the lunchroom today to enjoy the beautiful weather! Today we celebrated our April-Wildcat Wonders! These students having done an outstanding job displaying the WILDCAT WAY! They were nominated by classroom teachers and specialists! Great job WILDCATS! Our 1st/2nd graders & 5th/6th grade Chorus students put on an excellent Spring concert performance today! Thank you to Mrs. Canales for her hard work! Mrs. Krueger's 4th grade class was invited by the Village of Waterford DPW to Ten Club Park to celebrate Arbor Day by planting several trees and learning how to care for them! What a fun experience! 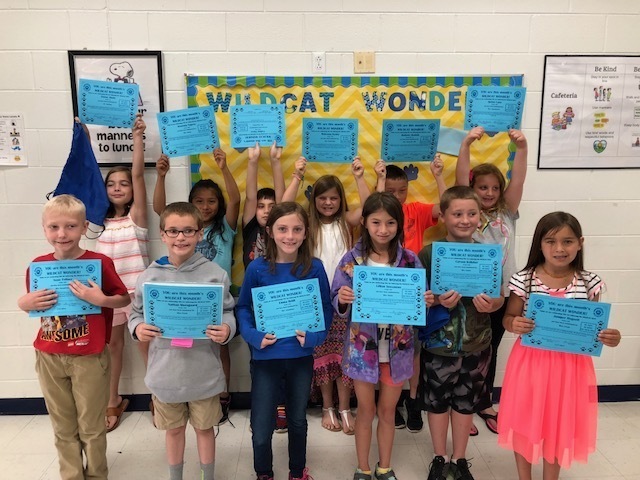 Congratulations to our March Wildcat Wonders! These students have been working very hard displaying the Wildcat Way! Our challenge for students in April is accepting differences! Great job, Wildcats! Our 2nd & 3rd graders hosted a STEAM Bunny theme day today! Great inventions by all! Please be aware of road construction and detours along Main St. Allow for extra travel time to and from school. Our wonderful 4th-6th grade Orchestra students played for our lunchroom during all lunch periods yesterday! Beautiful performances by all! 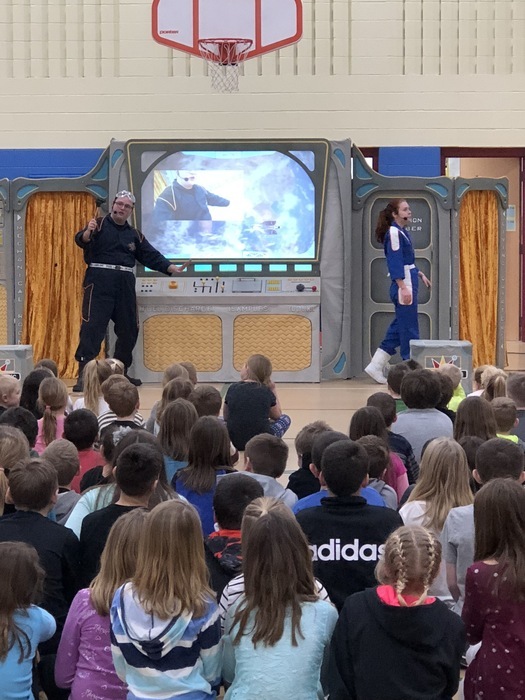 Kohl's Wild Theater came to WF to give a dazzling performance of: The Monarch - A Space Adventure for our 5K-5th graders! 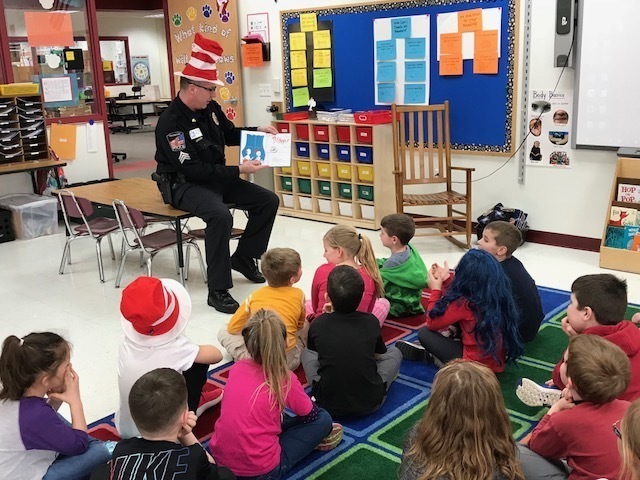 To celebrate "Read Across America" week we had community and district volunteers come in to read a Dr. Seuss book to our students. Congratulations to our PLTW teachers and students. Keep up the hard work. February's Wildcat Wonders! These students have done a stand-out job of displaying the Wildcat Way! Thank you for being kind, safe, and doing your job! Thank You for your support in our 1st year of Jump Rope for Heart! The students raised an amazing $10,300 to support The American Heart Association! We could not have done it without you! We are so proud of January's Wildcat Wonders! Woodfield is so lucky to have so many students displaying the Wildcat Way everyday! Congratulations to our Geography Bee winner Hayden! Great job! December’s Wildcat Wonders!! Congratulations and keep up the hard work!! 4K registration for the 2018-2019 school year will be February 6th & 8th from 11am-6pm. Please contact our office with questions, 262-514-8230. Congratulations to our door contest WINNERS from each wing! Our students/staff did an exceptional job with creativity and teamwork! St. Nick brought our students NEW playground toys! Happy Holidays to all of our WF families! Today student were treated to a Christmas story read by a guest teacher for earning Wildcat dollars! Teachers shared their favorite Christmas stories with a different class and spread some holiday cheer!! Congratulations to our Candy Cane contest winners! Students had the opportunities to guess how many candy canes were in a jar and hunt for candy canes! Woodfield Staff is ready for the holidays! Congratulations to our November Wildcat Wonders! Great job Wildcats! Woodfield Spirit Wear Available! Order forms were sent home Friday and are also available online. See NEWS section of Woodfield's website for more info! Orders are due Wednesday, Decemeber 6th! Congratulations to our Wonder challenge winners! These four students names were randomly selected for participating in our Random Acts of Kindness Checklist Challenge. Great job by all participants! Woodfield’s student council members put gift baskets together and make Thanksgiving cards. Coming soon to Woodfield Hot/Cold Breakfast served in the cafeteria! Check out this month's Wildcat Wonders! Great job Wildcats! Woodfield Students had fun on theme day!! Students in 2nd grade are studying habitats and today they created “homes” for their selected animals. Mr. Watkins has students creating “street art” to beautify Woodfield. The Waterford Fire Department came to review fire safety with our 4K-3rd grade students today! Monthly PBIS celebration of Wildcat Wonders! Keep up the good work Woodfield!! Fun at the Color Walk!! Thank you for your support!! Have a great weekend!! Hope to see you at the Color Walk!! Woodfield students got some help from some high school helper!! Thank you!! The Woodfield staff is excited for school to start!! See you Tuesday morning for the 1st day of school! In Person Registration today from 10:30-5:30 At Woodfield. The annual Woodfield Ice Cream Social is scheduled for Wed., May 24th after school until 5:00 p.m. in the cafeteria! We hope that you can join us to celebrate the end of another great school year!